Without doubt, it would have been a lot better if Wednesday's court decision favouring Ontario Conservatives had gone the other way — better for local democracy, better for rights and freedoms. Better to slow the train of cuts coming down the tracks. But it didn't. The Ontario Court of Appeal stayed the decision of a lower court that had struck down the Conservative's mid-point meddling in local elections. Without doubt it was a win for the Conservatives. If the people — rather than a judge — had been asked that they wanted, Bill 5 would be gone and the regular elections would go ahead. Two polls in the last week confirm that. 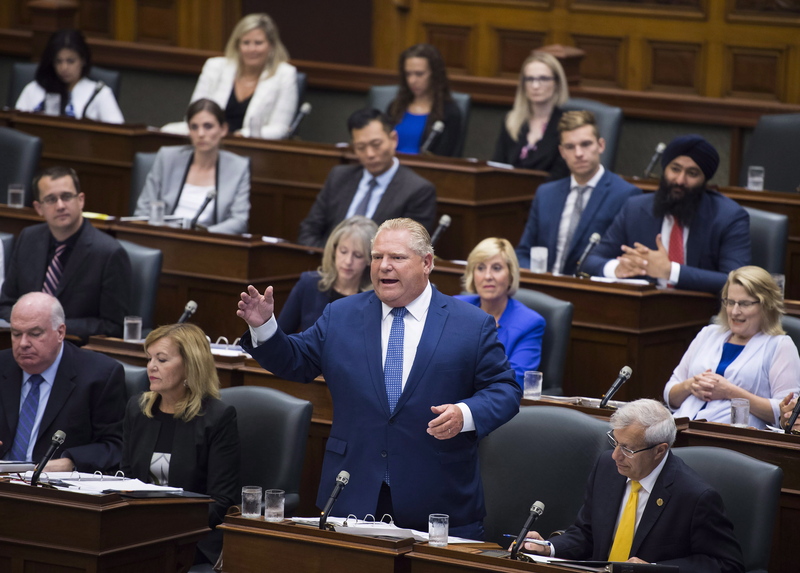 Ontario Premier Doug Ford speaks in question period in side the legislature at Queen's Park in Toronto on Sept. 17, 2018. Those polls show more than half the people oppose the Conservatives' plan — one they made no mention of in an election held just months ago, or their Throne Speech of just weeks ago. And about two-thirds oppose the Conservatives' threat to override fundamental rights and freedoms any time they hinder Conservative cuts and rollbacks. But a court is not a democracy. It's not a replacement for democracy. So this court decision isn't a loss. It's a wake-up call. Courts won't stop the Conservatives' planned roll-back of the minimum wage law and weakening of employment standards. They won't stop more back-of-napkin transit plans that waste billions in public money. They won't stop politicians selling assets for quick cash, like the last Conservative government did with highway 407. Or downloading onto municipalities. Or giving more tax cuts for corporations and high-income earners. Or letting opioid addicts die alone. Or cutting mental health services. Or dismantling the anti-racism secretariat. That's not a court's job. Slowing down the Conservatives means fewer people get hurt. This incident makes it abundantly clear these Conservatives don't care about rights and freedoms — let alone norms, practices and customs. They want what they want. Courts didn't give them this power. Voters did. And it will be voters who take it away. Municipal elections can slow them down — and they should. Social movements and the labour movement can slow them down — and they should. Slowing down the Conservatives means fewer people get hurt. But the hurting won't stop — and the healing won't start — until the Conservatives are voted out. Remember, the Conservatives can win an election with perhaps as little as 36 per cent support — thanks to our first-past-the-post system. Last election, 60 per cent of Ontarians voters were against the Conservatives — but that vote wasn't united. It's also important we don't try to stop the bully with compromise. We don't win by arguing for slightly smaller tax cuts for the rich. Or for slightly slower cuts to schools. Or a bit less privatized health care. Or suspending only some rights and freedoms. We don't win by half-way agreeing. Bullies will always accept compromises if necessary — then, as soon as they can, will use words offered in compromise to justify taking the other half. Wednesday's judgment told us courts will not protect us from bad political leaders. That's not their job. That judgment is up to voters.